There’s an ancient Chinese proverb that states “A bird does not sing because it has an answer. It sings because it has a song”. In that case, Yasiel Puig must have downloaded thousands of songs during his recent 6-week DL stint- because since his return- his bat has been singing astounding music. With recent offensive issues plaguing the Los Angeles Dodgers’ lineup over the last few weeks, they must be happy to see #66 back on the field and doing what he does best. Prior to the Arizona Diamondbacks series, the Dodgers lost 12 of their last 20 games, including sweeps by division rival San Francisco Giants and playoff nemesis St. Louis Cardinals. Dodgers’ manager Don Mattingly was on the hot seat and Dodger nation was scratching their heads on their recent woes. How did such a hot team, go cold so fast? As the losses started to accumulate, it appeared that their energy had evaporated as well. Fortunately for the Dodgers, their All-Star All-Everything outfielder Yasiel Puig was inserted back into the lineup, and he’s been on a tear ever since. As we might recall, Puig has a thing for fast starts (2013 season). 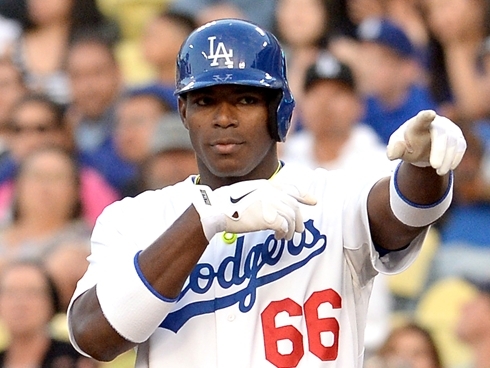 Since Puig’s return, he is batting .600, going 9 for 15. Not to mention the Dodgers are 3-1 during that span. Puig’s ridiculous play has not just revived Dodger’s fans, but his fellow teammates as well. In the four games since Puig’s return, the Dodgers are averaging just over 5 runs a game. To put things into perspective, the Dodgers scored 5 runs total during a 6 game stretch last month. Last night the Dodgers concluded a three game sweep against the D-Backs in dramatic fashion. Although Kendrick may have been the hero, Puig was definitely the MVP. Puig was 4-4, 3 RBIs, and fell a triple shy of a cycle. With the win, the Dodgers sit atop the NL West, just a game ahead of the Giants. With Puig back, the Dodgers may have created the most lethal top-3 batters (of a lineup) in the league. Slugger Joc Pederson at leadoff, Puig next, andAdrian Gonzalez third. Ouch, I feel bad for opposing pitchers.